Providence and Loweâs claim to the title was not an easy passage, as they had to come from behind to overcome the seasoned Onike Spann and 12-year-old first former student of the Georgetown Secondary School Kameisha Lampkin. Spann and Lampkin were cruising at 7-5, but Providence and Lowe stormed back to level the match at 8-8, then went on to win the tie-breaker at 7-3. Spann and Lampkin defeated Michael Nanton and Kamara Williams 9-2. In other quarter-finals action, Trevor Sam and Shania Williams whipped Kevin Mathurin and Janelle John 9- 4 and Khir Huggins and Zonnette Baptiste got past Kevin Huggins and Shauna Samuel 9-8 (7-3) in the tiebreaker. Then in the semi-finals, Spann and Lampkin overcame Khir Huggins and Zonnette Baptiste, 9-5, and Lowe and Providence saw off Trevor Sam and Shania Williams, 9-4. At a brief ceremony following the final, Providence and Lowe took the winnersâ trophies and Spann and Lampkin, the runnersâ-up trophies. 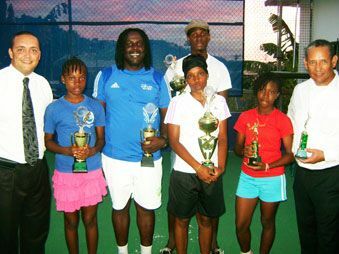 Michael Nanton and Kamara Williams were rewarded, having been adjudged the most outstanding pair.